Long story short, a designer and an engineer teamed up to create an elite class coffee brewer that’s supposedly one of a kind. The resulting product is the Espro Fresh. Wrapped in stainless steel and featuring vacuum insulation and micro-filters (patent pending), the Espro Fresh would rank as best of breed except for the fact that it’s such a new product. So new, that the creators Bruce Constantine and Chris McLean have gone Kickstarter to raise funds for a larger version. See, the Espro Fresh pictured below only manages a handful of cups tops. Espro Inc. are personally receiving customer orders. 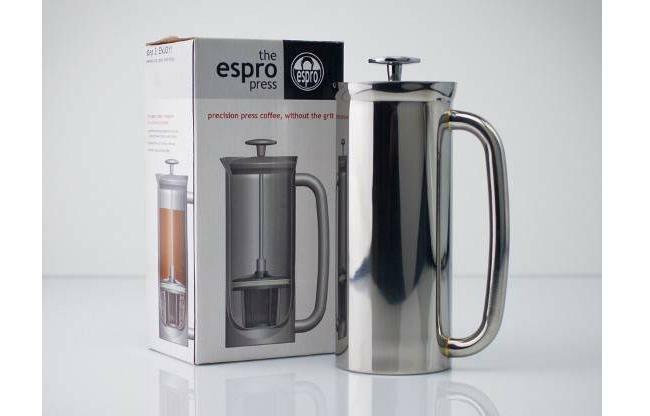 Each Espro press (call it the 1G model) goes for $70.